I ran out of space and have just been piling boxes in the room. It is driving me crazy. See what I mean? I have to take everything off those shelves and move them down to get that shelf on the back wall to fit on the wall with these two. Then I'm going to start making a special shelf for my home canned foods. 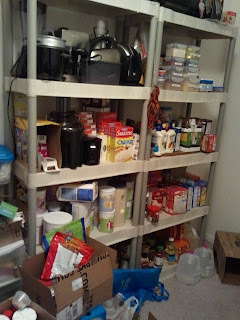 They cannot be stacked and purchased shelves waste space because the shelves are so far apart. 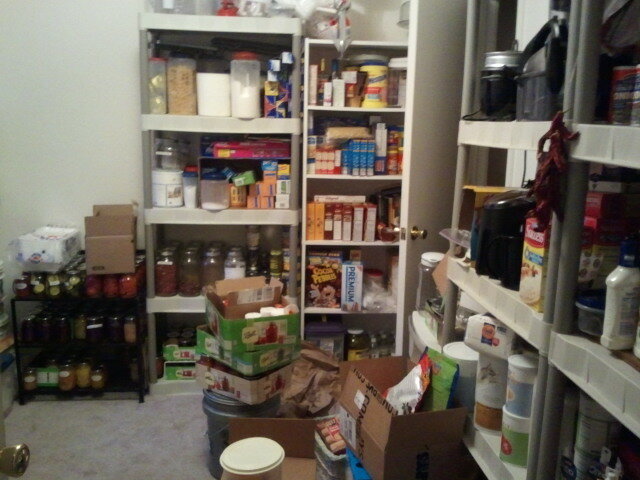 I don't even have a pantry to be messed up (or stocked up) like that! I don't either lol. That is actually an office space that I took over. The stocking up has been done over time by of course, couponing and when things are really cheap I buy one or two extra.